A Star Wars: Destiny event at Tiki Tiki Board Games in Woodbury, NJ. 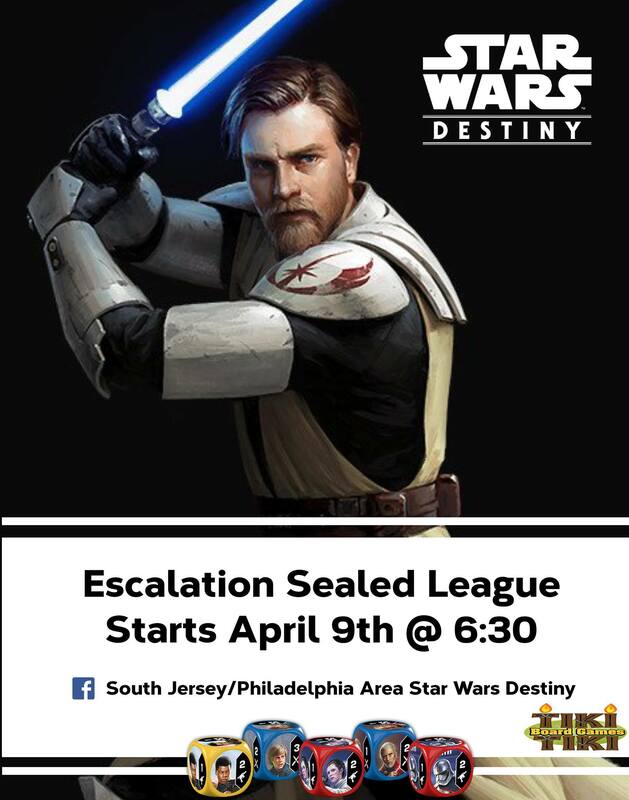 Join us as we kick off our 4 week Escalation League at Tiki Tiki! Entry will be one starter kit and 6 packs which costs roughly around $30! If you do not have one, contact Tiki Tiki about purchasing one or myself to borrow one if they do not have any to sell. Each player will pick either Obi or Grievous starter then crack 6 packs to help round out your deck. Each following week you can add 3 more packs but that is optional. Over the course of these 4 weeks we will keep track of your Ws and Ls. You can play each opponent in the league once a week. Player with the most points at the end will receive a prize donated from Golden Dice Podcast.